What is a Pollinator Garden? The page for gardeners in North America also has its own booklist. I have written an extensive annotated bibliography to do with wildlife-friendly gardening, wildlife in gardens, and naturalism in gardens (last updated May 2017). It is 33 pages long and can be dowloaded as a PDF file. Most recent books on these subjects are reviewed, together with many of the more important older ones. Some of the books that I recommend are out of print, but many will be in your local public library, and most are available on-line from second hand booksellers. This is still by far the best all-round textbook on this subject available. Although sponsored by the RSPB it covers all aspects of nature-friendly gardening. It separately covers gardening for many groups (birds, butterflies, mammals, bees, reptiles and amphibians etc.) and also covers the creation of different kinds of habitats in garden situation, and how to make various different kind of gardens nature-friendly (including, for example, low-maintenance gardens, vegetables gardens and even balconies). There is also a ‘top 400 garden plants for wildlife’ which is seriously well-researched and plausible. He also mentions species or varieties of plants which don’t give much for wildlife, which suggests the author has personally grown and observed many of these plants. This is the essential textbook, and if you are only getting one book on this subject, get this one. 978 0 7495 5912 0 225pp. This book was written by a scientific researcher (Mike Toms of the BTO) and a leading wildlife photographer (Paul Sterry) . They do not come from the world of horticulture and the slant of the book is natural history and science. There is an accurate, concise section on ‘wildlife friendly gardens’ on page 44, and they even tackle the controversial issue of ‘native versus non-native’ plants , a subject which many writers about wildlife gardening fail to deal with. This is one of the best books around at present for wildlife gardeners. Just perfect as a work of reference for schools. A comprehensive and well-illustrated book about butterflies, wild bees, and plants to attract them. In a large format and crammed with information. This is the first British book of this kind that covers in such detail both butterflies and wild bees and how to garden for them. Based on the results of research in Sheffield gardens, this small book discusses, and largely debunks, much of the 'received wisdom' that is current in the world of wildlife gardening, while re-affirming those practices that do make a difference to garden biodiversity. Like the research upon which it is based, this book will turn out to be very influential over time. Easy to read, in a chatty style, 'No Nettles Required' is in my view essential reading for wildlife gardeners. Some of its findings may prove controversial, but all the better if it stimulates debate and helps to move the theory and practice of wildlife gardening forward. The Wildlife Gardener. Creating a Haven for Birds, Bees, and Butterflies. Kyler books, 2013. ISBN: 978-0-85783-157-6 144 pages. An attractive, readable and book with plenty of advice for projects you can do yourself. The contents are accurate and well-informed, both about gardening and natural history. A very accessible work that would be a good ‘starter book’ to give to garden owners, or schoolteachers or budding gardeners who have some gardening knowledge or experience but would like to get a proper grip on the theory and practice of wildlife-friendly gardening. RBG Kew, 2017. ISBN 978-1-84246-626-1 252 pages. A discursive, autobiographical book that tells a story about the author’s development of her garden as an oasis that is chemical-free, full of attractive flowers, full of wildlife. Information about insects and other wildlife is seamlessly woven into the narrative in an easy non-technical way. This is a book that every gardener can enjoy. If only every gardener would follow the author’s advice. I also recommend the books about ponds, how to create wild flower meadows, and gardening with wild flowers by Jenny Steel. Harper Collins 2007 13-978-0-00-713993-4 326pp. - This is the long-awaited treatment of gardens in the iconic Collins ‘New Naturalist’ series. This is not a book about wildlife gardening per se. It is not a polemic; the author attempts to take an independent, scientific approach. This is refreshing and gives the book credibility. As a result he debunks some dearly held views. While its primarily aim is to discuss the natural history of gardens, it frequently casts a spotlight on the world of wildlife gardening (and gardening as a whole), giving us wildlife gardeners much food for thought and subject for debate. This can only be a good thing - the world of wildlife gardening needs thought-provoking texts like this to help it move forward. - Gardeners who are ‘non-scientists’ will find this an easy and readable approach to subjects such as soil, climate, pruning, weeds, and pollinators. Includes a short but interesting chapter on gardens and wildlife, in which the author discusses the controversial area of native plants and what plants to grow for wildlife. - Rather like a basic ecology textbook for gardeners, explaining important concepts from scratch, it then goes on to discuss 'interactions among garden organisms' and 'gardening as applied ecology'. - Simply the best book about insects and their partnership with garden plants that there is. Very readable and yet manages to give a complete rundown of insect classification and biology. Contains much on diversity on the garden, and why more diversity = more complexity = more stability. The Forgotten Pollinators. Shearwater Books, 1997. ISBN 155963 353 0. - A serious, but very readable and informative book about pollinators (especially bees), their conservation, and the role of gardens. relevant both to North America and Europe. One of my favourite books. Fascinating close-up photography with informative text. A classic work. Out of print, get it from a library or second-hand on-line. The first guide to Britain's wild bees for over a century! Really accurate, up-to-date, with lots of illustrations, photos, and the latest distribution maps. An attractive, readable book about Britain’s solitary bees that is accessible to the non-specialist and is packed with information and insights. It is not an ID handbook (go to Falk and Lewington for that) but the author provides easy keys to the genera of solitary bees. This can be used as a stepping stone by the interested reader who is perhaps new to the world of solitary bees and wants to develop their ID skills. Of particular interest is Chapter 5, which is headed as a discussion of bees and flowers but which actually introduces the major concepts and controversies of pollination biology which affect all British pollinators, and it is worth reading the book simply for the insight which this chapter provides. 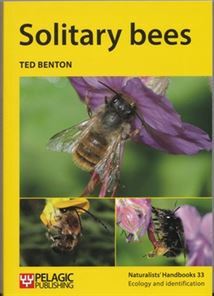 Chapter 6, which covers conservation, deals among other things with open spaces and gardens and the advice and examples which Benton gives, while focused on solitary bees, would also be of benefit to other pollinator groups. Please go to section 4 of my Bibliography (download from link above) for reviews of a number of other recent books about wild bees. A new online tool offers advice on planting gardens for bumblebees. At last - a book devoted to solitary bees... and it's brilliant!